A shock and a laugh is what you get from us! We are partners in crime and focused on taking over the world. Performing classic sideshow entertainment with a contemporary twist and delivering zingers and stingers is what we do best! You can call him a sword swallower, human blockhead or fire breather; I call him the mister. You just call me Maybelle; we’ll get along fine! You may have caught our act at Ripley’s Believe It or Not!, on “America’s Got Talent” Season 6, Six Flags Over Georgia’a Annual Fright Fest, “Atlanta & Co.”, “The Soup”, Coney Island’s Sideshows by the Seashore or a myriad of other equally impressive opportunities. My name is Tyler Allen, i am 20 years old and i live in Dallas, ga. 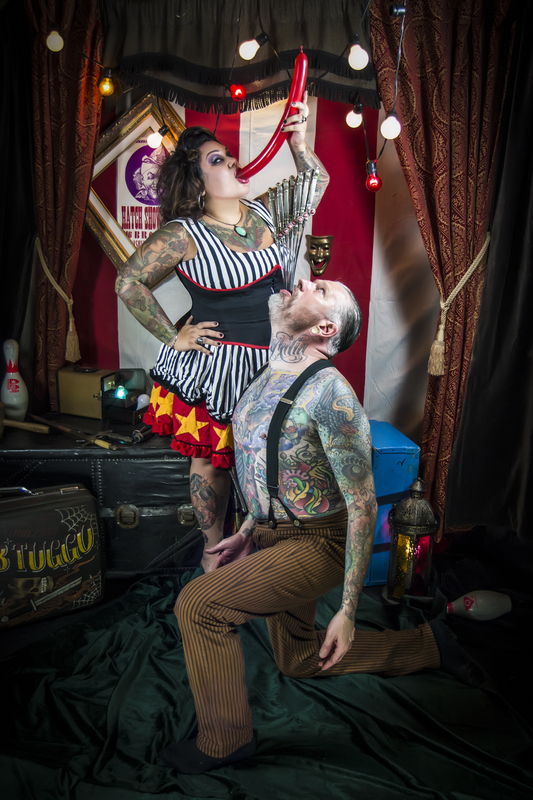 I stumbled across your website when i began to do more research about the whole “circus acts/sideshow” industry. I think what you guys do is pretty amazing. I plan to begin training myself to swallow very soon and was just curious if you had any tips. i know most people will tell me not to do it so i understand if that is the case for you but i plan to start with small objects such as my toothbrush, spoon, wire hanger, etc. If there is a better tool to use while trying to train my throat and gag reflexes please let me know. i would love to see you guys perform and would like to hear back from you. Thank you for your time and i hope to talk soon. Hi Tyler! Thank you for your message! You are absolutely right, Captain would tell you not to do it. We do receive messages often, asking for tips/tricks or just any knowledge that can be shared. To every message, I say the same. With only the best intentions, we can offer nothing. Captain is a self taught sword swallower, as most are, you are probably discovering in your research. Reason being, it is a very dangerous skill to hone. Captain seriously injured himself when he was learning (and we are still paying off that medical bill, 10 years later!). Be smart, be safe, and don’t push yourself too far! Good luck! My name is Qeyanna and I would like to speak with you in regards to booking your show for our upcoming Shriners Magnificent Festival. Hi Qeyanna! Can you email me directly at: mrsmaybelle@yahoo.com? Let’s see if we can make it happen!